OLD PARKED CARS. : 1975 Ford Mustang II Mach 1 Electric Hatchback. 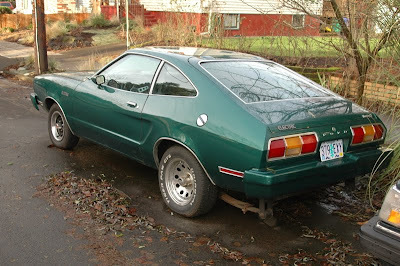 1975 Ford Mustang II Mach 1 Electric Hatchback. 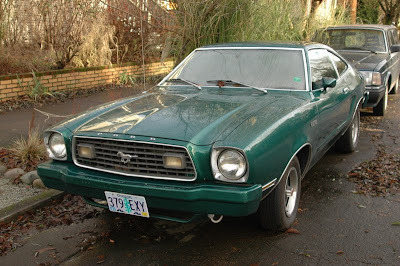 Just about the coolest mid 70s Mustang I can imagine. That back angle and side profile are gorgeous. Look at that chiseled door accent. This thing must fly at the drag strip! I think I've seen this thing gassing up in downtown Oregon City. Yes, I had the chance to carsit this for a spell and it's pretty rad! It's a beast and the batteries added a good 800 lbs, so wouldn't win any stoplight drag races, but you can't deny the cool 70's feel. At first I was like "aw, it's a Mustang II?" but I have to admit it grew on me. 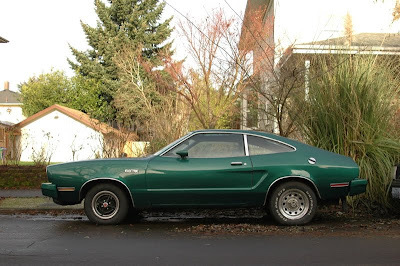 I'm pretty sure it's one of a kind - there is a website we're all on called EVAlbum and there aren't any other Mustang II's. Plenty of I's and 80's/90's but not a single pinto inspired II on there. Only in Portland!